Jeremy Hunt, British Foreign Secretary says two years of potential military rule in Sudan "is not the answer" for "real change" in the country. 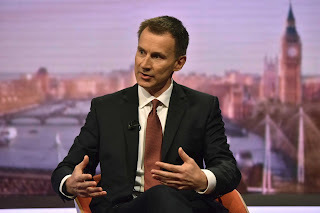 Jeremy Hunt, British Foreign Secretary. He twitted on Thursday that Sudan needs "a swift move to an inclusive, representative, civilian leadership" and an end to violence. The leadership was taken over from President Omar al-Bashir by Sudan’s military hours earlier in response to nearly four months of escalating popular protests in which dozens have been killed. The Sudanese defence minister has announced that a military council would rule for two years. The constitution and imposed an emergency clampdown that risks enflaming protesters who have demanded civilian democratic change has been suspended by the military. Protest organisers have said they won't back a military coup and are now in discussions with the military's leadership about forming a transitional government. On Thursday in a statement, the actor, director and activist said, the international community must work to guarantee that "the next president of Sudan reflects the will of its people. Clooney called al-Bashir "the leader of a violent, corrupt system" and noted that the face of the coup, Defence Minister Awad Mohammed Ibn Ouf, has also been sanctioned for war crimes in the Darfur region along with the ex-president.